1. Preheat oven to 180˚C, gas mark 4 and line a heavy tray with parchment paper. Whisk the flour, ground almonds and baking powder in a bowl and set aside. Using an electric mixer with a paddle attachment, beat the sugar, lemon zest, butter and salt until fully combined. Add the eggs one at a time. Add the flour mixture and mix until just combined. On a low speed add 12g of the ground coriander, until combined. 2. 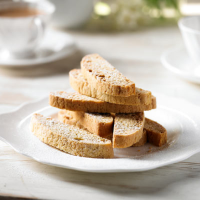 Shape the biscotti into 2 logs, roughly 5cm wide, and place on a large baking tray with plenty of space between them. Bake for 20-25 minutes until light brown. Remove from the oven and reduce the oven temperature to 150˚C, gas mark 2, and cut into 1-1.5cm thick slices and lay flat on the tray. Bake for about 30 minutes, until dried out. 3. While it is cooling, mix the icing sugar and the remaining ground coriander. Sprinkle on top of the biscotti before serving.